Before Lord Grey’s mug gets handed off this Sunday let’s review what in August was inconceivable, the Lions chances for winning it all. I’m not going to delve into all the scenarios based on team records to win a Grey Cup, which was done with my previous article here. Instead let’s focus on the two teams that made it. Statistics look to be on the Lions side so far this year because everything that should be happening is happening. Case in point the two best teams in the league should be meeting at the dance and that’s exactly what we have with the Lions sporting a better record in a tougher conference. Edge Lions. The Lions regular season winning record of 11-7 is tied with a 13-5 record for making the Grey Cup nine times; this is the most of any other records in the last 20 years. The Lions 11-7 record does not have the highest winning percentage at the Grey Cup, winning two out of the nine games for a paltry 29%. Fear not, the Bombers record is worse! A 10-8 record has made the finals six times and has just one win for a pedestrian 20% winning percentage. Edge Lions. Interesting to note the one and only time in the last 20 years an 11-7 team played a 10-8 team in the finals was at our barn and the better record won. The 11-7 Eskimo’s beat the 10-8 Alouettes in overtime in 2005. Edge Lions. The Lions were tied for the most offensive points in the west with 511 compared to the Bombers 432. Edge lions. On defense you would believe with all the Swaggerville hype all season Winnipeg would support the stingiest defense in the league. You would be wrong. That impressive statistic would befall the Lions allowing a mere 385 points against to lead the league in that category. Edge Lions. And here’s quite possibly the biggest edge. Since Wally Buono took over the Lions in 2003 the team has been a juggernaut at BC Place Stadium. They have a combined 49 wins to 18 losses record, which results in a 73% winning percentage in the regular season. Edge Lions. Although it’s important to note during Buono’s tenure in playoff home games the Lions are 2-2 for a .500 record. In 1994 when the Vancouver Canucks made the finals and subsequently had a riot, the Lions picked B.C. sports fan spirits way high by winning the Grey Cup at home in a memorable run. They were also the last team to win a Grey Cup on home soil. So I ask you are we about to experience déjà vu all over again? The 99th Grey Cup championship may be sold out but if you’re willing to do a little sleuth work and have a bit of luck, you could win tickets to the big game as well some sweet VIP perks. Tourism Vancouver is giving away two tickets to the Grey Cup, along with two nights accommodation, and VIP access to Doolin’s Irish Pub and the Roxy Nightclub. A Mystery Man will be wandering the streets of Vancouver AND Winnipeg starting Tuesday, November 22nd between 8am and 7pm, until he is caught. To win, the winner must be the first person to find him and say the secret phrase. The secret phrase can only be found on the Tourism Vancouver Facebook Page. You should also follow the @GreyCupChase Twitter account to make sure you get all the latest information in case we get caught up in the festivities. Here are your clues for the day. Some are minor hints but the picture clues should give those hunting a good idea of where to find the Mystery Man. 1. At 8:30am the Mystery Man will be having breakfast somewhere in the city. 2. 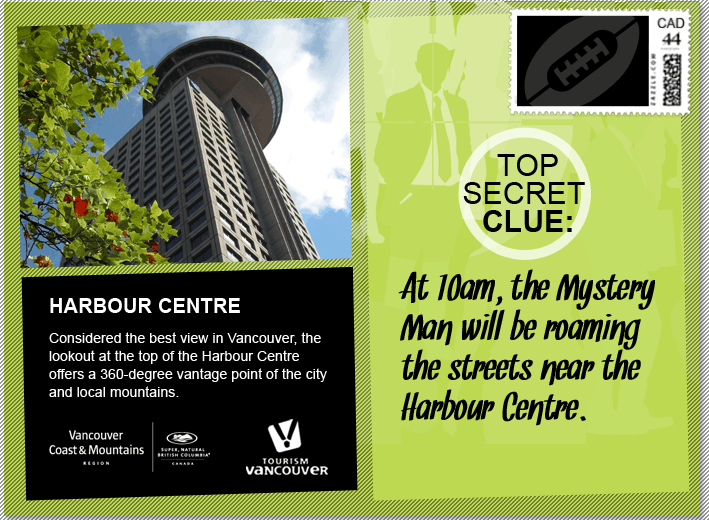 At 10am, the Mystery Man will be roaming the streets near the Harbour Centre. 3. At 12:30pm the Mystery Man will start thinking about having lunch somewhere. 4. 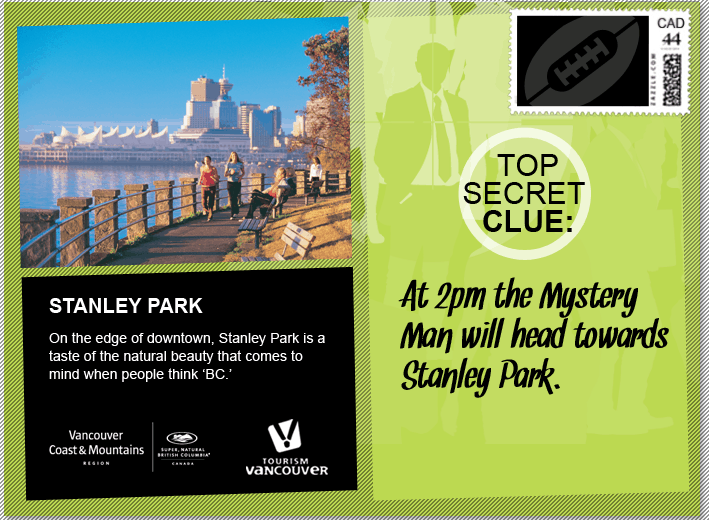 At 2pm the Mystery Man will head towards Stanley Park. 5. At 4pm the Mystery Man will grab a drink to warm up. 6. 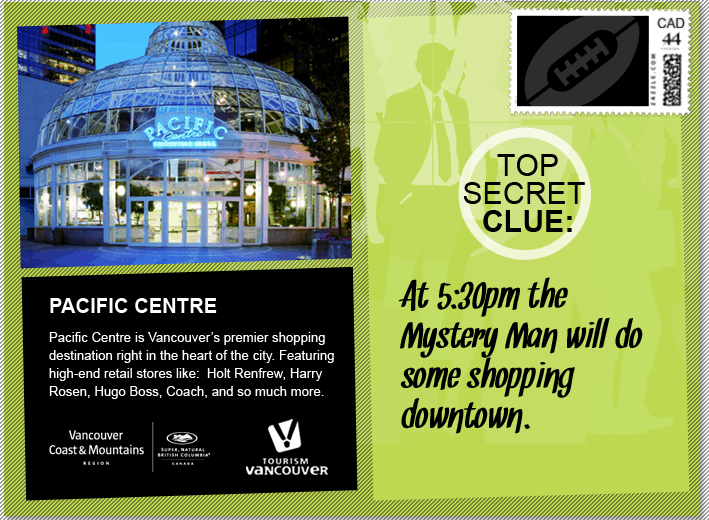 At 5:30pm the Mystery Man will do some shopping downtown. 7. At 7pm the Mystery Man will pack it in for the night. Ask anyone and everyone you see, they could be the mystery man! Grey Cup 2011 Party Series: Get social, at Touchdown Manitoba! This series of blogs will take a look at some of the best parties of Grey Cup week as we count down to the Vancouver event, November 24th to 27th. In this edition, we take a look at the event that puts the “social” into party, the very popular Touchdown Manitoba. The province of Manitoba is known for its parties known as “socials” and every year at Grey Cup they throw their biggest party of the year, affectionately known as Touchdown Manitoba. The unique aspect to the party is that unlike most of the parties at Grey Cup it is held during the day, providing a great party option for those looking for an early start on Friday’s festivities. Touchdown Manitoba was established after a successful 1991 Grey Cup Festival in Winnipeg. The organizers decided they wanted to keep that spirit going at future Grey Cups and the event was born. That spirit is in the form of a traditional Manitoba social and it’s become one of the most popular events of Grey Cup week. Like other parties at during the week, Touchdown is a melting pot of CFL fans from all teams coming together to celebrate Canadian football in the spirit of the Grey Cup. The event obviously has a Blue and Gold theme and some of the CFL’s most loyal fans come from the Manitoba capital and surrounding areas. With the resurgence of the Bombers, this year’s event should be a great one. You may even run into a little swagger! You can expect to see a few Bombers players/personnel, great live entertainment and enjoy some traditional Manitoba rye bread, kobasa, cheeses and pickles for some much needed party fuel. Tickets are available now and will also be available at the door in limited quantities, which at this time may be your best option. There are tables and chairs at the event, another unique aspect compared to other parties, but get there early if you want one as they disappear quickly once the doors open. Live music by headliner band Faith & Desire as well as a DJ to keep you dancing all afternoon. A limited-edition Touchdown Manitoba 2011 lapel pin (while supplies last). A delicious “social buffet” with all the traditional delicacies – rye bread, kobasa, cheese cubes and dill pickle spears. (while it lasts). Appearances by cheer teams, including the Labatt Blue Lightning Dance Team. A Choice Auction, with loads of great PRIZES! Get your picture taken with the Grey Cup! We’ll see you, at Touchdown Manitoba! A recent video by Global News BC takes a closer look at the massive roof project at BC Place and gives an update on the construction.